Yesterday was a wonderful day even though it was rainy and cloudy in the Blue Ridge Mountains. At the invitation of Andy Mitchell, I accompanied him and his friend and new convert, Keith, to the Carolina Preachers Study in Ashville. My friend Joe Greer and his son-in-law, Ben Walker organized the study with over 20 preachers attending. The theme was based on the book of Jeremiah. It was a time of pleasant association and edifying study. We were encouraged on several levels to learn personal lessons of persistence, dedication, and determination from this great prophet of God. One of the passages considered that stands out is Jeremiah 20:9. In it we get a glimpse of his heart and passion for preaching God’s Word. Jeremiah had suffered mentally, emotionally and physically because he preached the Truth to the people of Judah, the princes, the priests and the King. They had turned their backs on God, were worshiping idols and engaging in abominable and abhorrent practices that should have caused them to be ashamed. But they were beyond blushing. When Jeremiah called them to repentance, he was ridiculed. Treated with contempt. Riddled with derisive insults. Mocked and made a laughingstock (Jer 20:7-8). The personal animus the prophet suffered left him disheartened, discouraged, and disenchanted. Jeremiah was almost ready to quit. To pack it in. To throw in the towel. Let someone else take the heat! These people won’t listen. And they don’t care. And I’m sick and tired of trying to teach them. But something happened to Jeremiah. He couldn’t let go. He wouldn’t give up. His heart wouldn’t allow it. 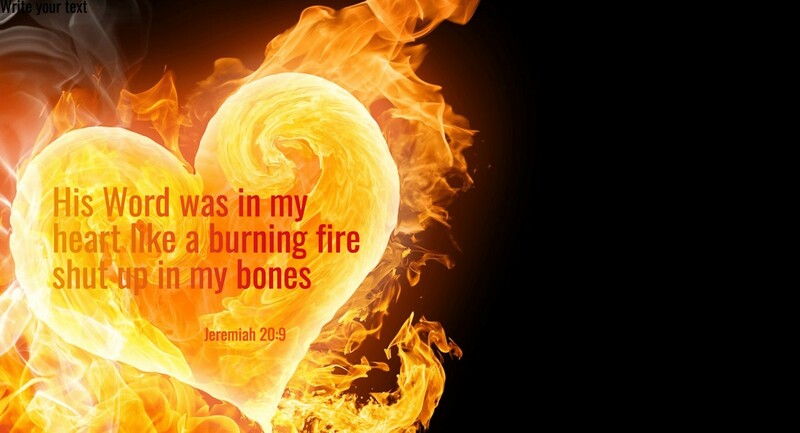 The Word of God burned like a fire in his heart. Jeremiah was discouraged. But he wasn’t defeated. He was battered. But he wasn’t beaten. He was knocked down. But not knocked out. He was hurting. But he wasn’t helpless. There are several lessons here, not only for preachers and pastors but for all Christians. (1) Godly people can get discouraged. This great prophet of antiquity found himself demoralized by the wickedness of His world. The indifference of God’s people. And the failure of the religious leaders to address it. Not much has changed in 2600 years, has it? Don’t quit, because you’re discouraged at the pervasive nature of sin. Every generation has had its share of ungodliness. (3) Allow God’s Word to get into You. We often speak about “getting into the Word,” well, Jeremiah let the Word get into him. Into his mind. Into his heart. Into his soul. And it burned like fire. It consumed him. When God’s Word is in us, we can’t hold in it. We can’t help but share it. Teach it. Or preach it. Furthermore, when the Word is internalized it will keep us from sin and lift us up. Let’s overcome our discouragements. Rise above the ridicule. And lean on the Lord in times of trouble. Let the Word light a fire in your heart. And don’t be afraid to speak up and speak out to a corrupt culture that needs to hear the Truth. God’s Word is pervasive like a vine. Happy and wise is the vinedresser, the gardener, who allows God’s Word to get into him. For as Psalm 128: 1-3 says: “Blessed are all who fear the LORD, who walk in His ways! 2For when you eat the fruit of your labor, blessings and prosperity will be yours. 3Your wife will be like a fruitful vine flourishing within your house, your sons like olive shoots sitting around your table. Thanks Ken for allowing the Word of God to get into your bones and create a fire in your heart. Tradition calls Jeremiah the weeping prophet and like the Woman weeping at the Tomb in the Garden looking for her Lord and her promised restoration and vindication, Jeremiah is looking for Israel to be restored and a new covenant made between the house of Israel and the House of Judah (Jer. 31:31-34) Idolatry, inequality and adulterous living have made the two houses enemies and put them at odds with their neighbours. In the Garden outside the Tomb, the Rabbouni says to the Woman, Mary! Hearing the name Mary! the Woman turns. The word Mary sinks in. It is packed with meaning. When the Widow Naomi returns to Bethlehem and the whole town is stirred up and the women say “Is this Naomi?” Naomi said to them, “Call me no longer Naomi, call me Mara, for the Almighty has dealt bitterly with me (Ruth 1:20). The narrator of John’s Gospel tells us this name means Teacher. The Teacher of Israel and Jesus met under the cover of darkness (John 3:1-20). As he too allows the Word Rabbouni to sink in, to go deep into his bones and his heart…the Teacher surely remembers how “Nicodemus” the Teacher of Israel defended Jesus when the Chief Priests and Temple Police asked who is this Jesus and then set a trap for the Teacher people say is Jesus with the Woman they say has been caught in the very act of adultery (John 7:50 – 8:11. And as the words of the Teacher whom she loves and admires, sink into the Woman’s heart and her whole body, she recalls the Psalms, the Songs and the Singer whose words lift her up and ignite her heart…keeping her from sin. The Teacher has not stolen her Lord’s body. Her Lord is the male gazelle who sings to her, lifting her up like a young gazelle and he is the Lord she longs for (Song of Songs 8:14; Acts 9:36-41). This Lord brings her alive with his love!! And her love restores his walk…keeps him standing tall and walking straight (Acts 4:8-12) as he reaches out the right hand of fellowship to the Teacher whose gracious wife calls him Lord (John 11:26). As the Word of God sinks into the hearts of both Ladies and both Lords and a cloud of witnesses who love them, the ascension takes place. (Luke 24:50.